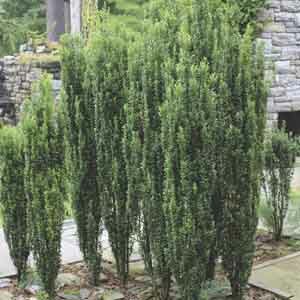 A fresh take on a garden classic, 'Sky Pencil' has all of the terrific features of standard hollies but with a slender, vertical growth habit. Makes a dramatic statement in the landscape and is a great solution for gardening in tight spaces. No pruning is required to maintain this shrubs lovely shape, but it can be pruned freely to control overall size. Displays good drought tolerance once well-established. Great for adding a strong vertical, architectural appeal to borders, hedges, or foundation plantings. Excellent for planting along fences and walls and can also be grown in large patio planters. Provides dramatic form to autumn and winter landscapes. Adapts to most soil types. Prune to maintain desired shape. Water regularly until the plant is well established.